On Saturday, August 22nd, the Skeptical Society of St. Louis will be hosting the region’s third SkeptiCamp at the Ethical Society, 9001 Clayton Road, St. Louis, MO 63117, starting at 9am. This is an all-day event. This year’s event includes presentations on topics as diverse as anti-vaccination, Creationism, neurology, climate change, financial skepticism, child psychology, the Fukishima disaster, incorporating skepticism and critical thinking into the classroom, the psychology of magic, solar energy, stuff your massage therapist tells you, anthropology, non-profit myths, and more. We will also be presenting a screening of “The Vaccination Chronicles” by Richard Saunders, former president of the Australian Skeptics and host of the Skeptic Zone podcast. Pizza will be available for lunch and there will be a Skeptics in the Pub following the event. A silent auction for a signed copy of Bill Nye‘s latest book, “Undeniable,” and skeptical/scientific jewelry from Surlyramics will be available for purchase. The auction and a portion of the proceeds from the jewelry will help the Skeptical Society of St. Louis continue to promote science and critical thinking in the St. Louis community. This event is FREE and OPEN TO THE PUBLIC. You can find more information about this event on our website www.skepticalstl.com/skepticamp or by searching for Skeptical Society of St. Louis on Facebook or Meetup. We do ask that you RSVP for this event so we can get a good headcount for the lunch. You may RSVP here. We hope to see you on Saturday, August 22, 2015! Our 2015 Give STL Day total! The second annual Give STL Day was held May 5, 2015. This is a 24-hour, online giving event coordinated by The Greater Saint Louis Community Foundation to promote philanthropic giving across the greater St. Louis community. It’s a wonderful event for small non-profits, like The Skeptical Society of St. Louis, to be involved because the Foundation takes care of all of the logistics, including setting up the donation website, developing promotion materials, creating social media message suggestions, obtaining sponsors to donate prizes and matching funds, and helping to promote the event via media campaigns that include television, radio, and billboard. All we have to do is promote the day to our potential donors! This is a high-quality fundraising event with a potentially big impact for small organizations and a decidedly significant impact to the region. 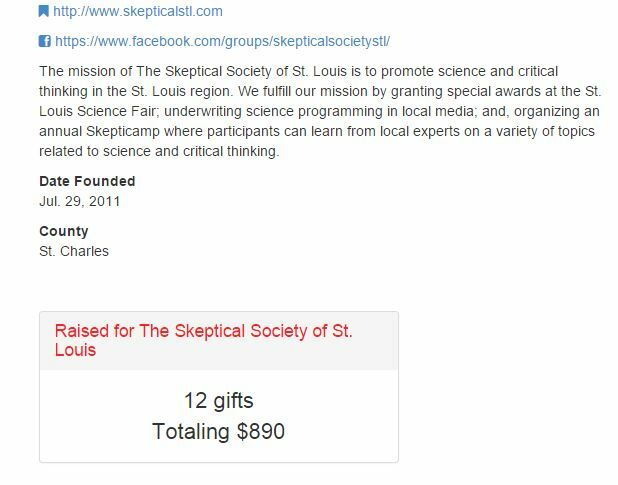 The Skeptical Society of St. Louis was honored to be one of 790 non-profits throughout the region to participate in this year’s giving event. As of May 6th, the event generated 20,260 gifts totaling nearly $2.1M (as in million)!! The 2014 event had somewhere around 13,000 gifts for a total around $1M – so 2015 more than doubled the amount raised! Well-done St. Louis! (in case you were not aware, St. Louis is consistently ranked as one of the most philanthropic cities in America). $400 – to set up 2 (two) $200 special awards for K-5 students at the 2016 St. Louis Science Fair. These funds are deposited directly into the winning students’ 529 education savings accounts to be used for their future education. $50 – to purchase a couple of critical-thinking books to be packaged with the special award money. $440 – to cover expenses for the 3rd Annual SkeptiCamp to be held Saturday, August 22, 2015. Any additional donations (matching gifts, etc.) will be used to fund this annual event. Not too shabby for a small, grassroots organization with a renewed focus on promoting science and critical-thinking in the St. Louis area. We will continue to grow and continue to have more impact in our community. The Give STL Day event is one of the ways we will be able to accomplish our goals. To everyone who donated, THANK YOU! We are a 501c3 organization and you will receive your donation acknowledgement letter for your taxes in the mail soon.